I had this date circled on the calendar since Jack made the team. 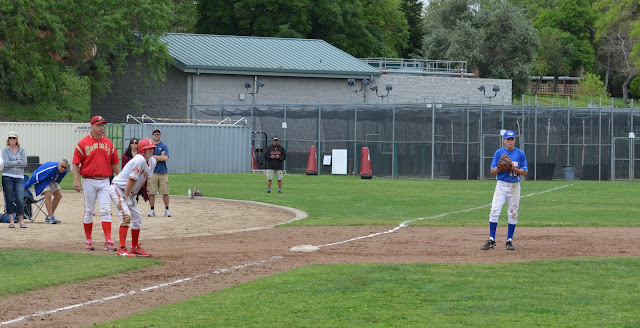 The Jesuit frosh Marauders baseball team played the Christian Brothers Falcons. Jeremy is on the Falcons, as well as Anthony and Marcus who went to SEAS with Jack. It was probably the most boisterous youth baseball game that I have ever attended. The parents and the kids were loud for the whole game. Jack started in centerfield and lead off. At the plate, Jack was 3 for 4 with a double, two singles, two runs scored and a RBI. In his first at-bat, Jack struck out swinging on a 2 and 2 curve ball. He crushed a 0 and 2 pitch over the head of the centerfielder for a double in his second plate appearance. Jack said after the game that he was surprised that the pitcher threw him a high fastball with two strikes. He went to third on Bailey's grounder to the right side (an error) and scored on Nick's ground out. In his third at-bat against Jeremy, Jack hit a 3 and 2 pitch for a hard line drive up the middle. The shortstop made a nice try, but it nicked off his glove. He went to second on Bailey's single through the left side. The next play was really a microcosm of why Jack has been earning playing time. Nick hit a 3 and 2 pitch for a sharp grounder right at the third baseman. The third baseman was playing a couple of steps behind the base and Jack got a good jump off of second. When the third baseman bobbled the ball, Jack was able to beat him to the base. He scored from third on Jared's sacrifice fly down the first base line. Jack said after the game that he would never have been playing that far back at third base. Jack's fourth plate appearance was a second example of why he has been earning playing time. Jack hit a 1 and 0 pitch for a grounder deep into the hole on the left side. The shortstop made a nice backhand stop. Jack got a good jump out of the box, hustled down the line, and beat the throw. Sogard never stopped running from second and scored. Jack ended the inning at first when Bailey hit a soft line drive to the second baseman. Jack played seven innings in centerfield. For the second straight game, he did not have a put-out or an assist. Jack made a diving attempt on a soft fly ball in left center and had another ball crushed over his head. He made a nice throw on the one over his head and almost got the runner at second. Christian Brothers scored in each of the first five innings. Jesuit kept trying to claw back into the game. The Falcon led by the score of 8 to 6 after five innings; 4 of their 8 runs were unearned. On the strength of Jack's RBI, Jesuit closed the score to 8 to 7 in the bottom of the sixth inning. The Marauders relief pitchers couldn't hold the Falcons in the top of the 7th giving up 3 earned runs. Undone by five errors and ineffective relief pitching, the Marauders lost the game by the score of 11 to 8. The box score is here and the scorecard is here. The losing pitcher was Iwasa (3-1, ERA 3.59, 5 Starts). Kane's struggles as a relief pitcher continue; he has an earned run average of 19.1 in four appearances. I got texts from several people saying that they couldn't believe that the boys lost to Christian Brothers... I am looking forward to the rematch on Saturday, April 26. The Jesuit Frosh baseball team now has 9 wins and 4 losses. In league, they have 2 wins and 1 loss. The game log is here. The Marauders next game is Monday, April 8 against Casa Roble.